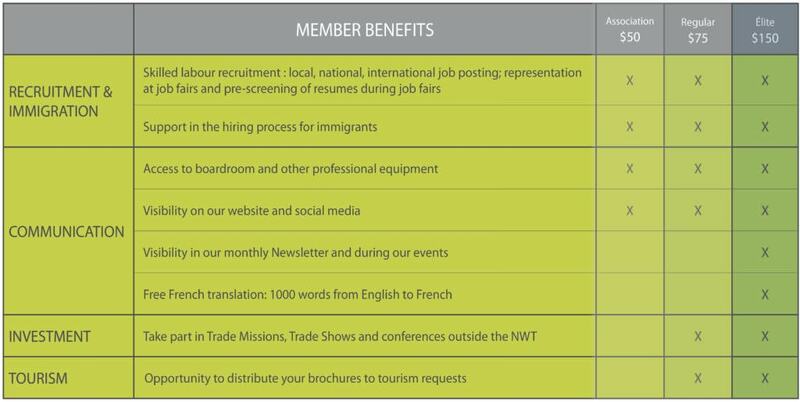 CDETNO (Conseil de développement économique des Territoires du Nord-Ouest) offers services to English-speaking businesses looking to pursue opportunities in the Northwest Territories. Your membership provides you with business tools and workshops to support you in the recruitment of skilled labour, attraction of investment and networking, while helping you increase the visibility of your business and develop new business opportunities. Associations should contact Mélisande Alric, Administration and Tourism Coordinator (867-873-5962 # 2), to proceed with membership or renewal.